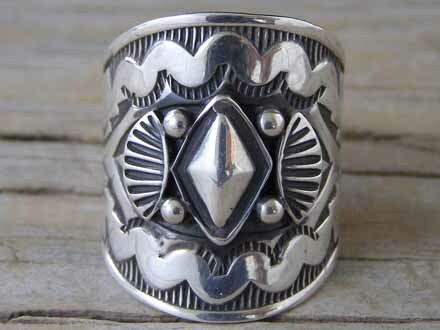 This is a style of ring that Derrick began making in the fall of 2009. The shank is particularly wide in front, then dramatically tapers to a much narrower width in back. Beautifully stamped and decorated with appliqueés, an oxidizing agent was used on this to develop tarnish in the stampwork to heighten the contrast between the stamped motifs and the smooth polished surfaces. Note on sizing: It is the narrow shank in back which renders this a very comfortable ring. But there is a peculiarity of sizing because of the design. So make sure you order a half-size larger than you usually wear (even in wide shank rings). Stamped Sterling and hallmarked Derrick on the inside of the shank. Width of shank in front: 1" Width of shank in back: 1/4"